Atlanta Floors offers hardwood floor refinishing Roswell, Georgia homeowners can trust. Why? Professionalism. Expertise. Excellent customer service. High quality materials. You shouldn’t settle for anything less. The good news is you can get all of this when you work with our expert team at Atlanta Floors. Whether your hardwood floors just need some repair, a major refinishing job, or a new installation, we’ve got you covered. We can take what you have and give you a beautiful hardwood floor result. Our team takes your flooring project seriously—we strive to exceed each customer’s expectations. Maybe you are working in one room or your entire home or business, our dedication to excellence is the same. So your expectations for hardwood flooring services are pretty high? That’s good. They should be. Here’s the thing—our passion is hardwood floors, so we are confident we can meet and exceed your expectations. At Atlanta Floors, we have spent our careers studying the hardwood flooring processes, so we can become experts at our craft. Now, we are here in the Roswell, Georgia area to deliver these services for your home or business. If you are a homeowner or business in Roswell, GA, looking for hardwood floor refinishing or installation services, call Atlanta Floors. These guys rock! One day and done. No fuss, no hassle. Great price too! I highly recommend them to anyone who needs flooring done. 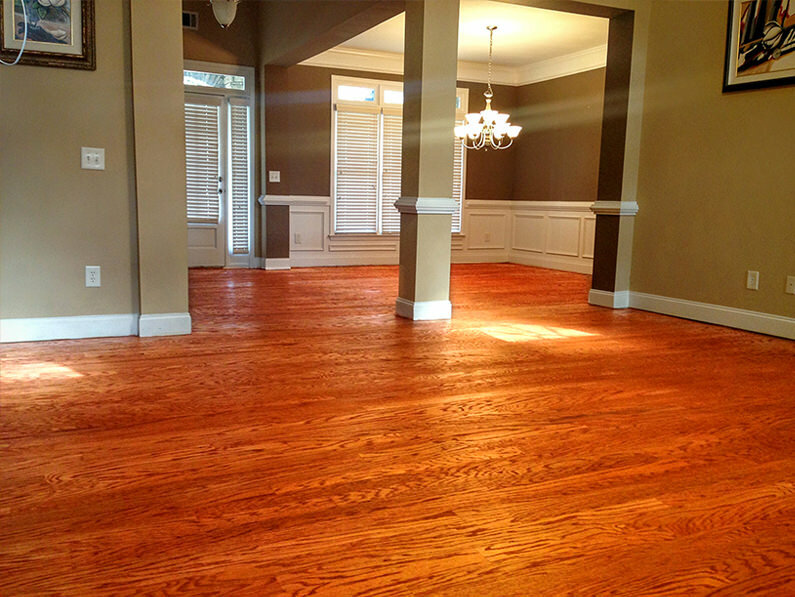 Residential hardwood floor refinishing Roswell homeowners rave about. Refinishing for any solid wood floor species, many engineered wood floors, and even stairs. The highest quality materials, so your hardwood floors will be beautiful for years to come. At Atlanta Floors, our streamlined services ensure a beautiful result each and every time. We have the hardwood floor refinishing, repairing, and installation processes down to a science. This also means we can keep our prices affordable—we don’t cut corners, but we also will not waste our customers’ time. Contact our friendly team today for your quote from the top hardwood floor company Roswell residents and commercial spaces trust. Connect with us online or call 404.915.5054 to speak to one of our team members. We provide hardwood floor refinishing Roswell GA trusts.